There’s no doubt that we love our pets. In New Zealand, 58% of us own some kind of pet, and we love spending money on them too. Pets bring so much into our lives, whether it’s the unconditional love and loyalty we receive from our dogs, the stress-relief provided by watching our new kitten’s funny antics or from stroking our cat and hearing them purr, or the exercise that we’re forced into at ungodly times of the day by a puppy that’s raring to go! But how many of us invest in pet insurance for our furry friends? And how many of us wonder when it comes to paying for pet insurance, is it worth it? 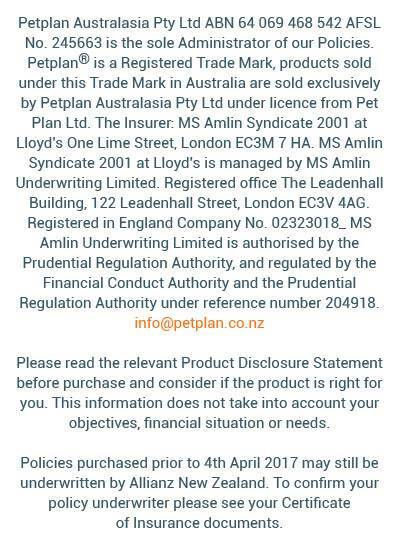 Petplan has been providing affordable pet insurance for the pet owners of New Zealand since 2004, and we like to think that we offer value-for-money policies that enable you to pick the level of cover that you’re comfortable with, both in terms of coverage and cost. There’s no doubt that the cost of pet insurance is an important consideration when owners take out cover, and we want to ensure that you get the right level of cover at the right price. While it is tempting to just go for the cheapest pet insurance provider, this may not be the best solution, especially when there are things that you can do to keep premiums down and still get the cover you need. Pay a higher excess – opting to pay a higher excess may reduce the overall cost of your premium. However, you need to be realistic when settling on an excess. You need to be sure that you could find that money should you need to make a claim. Don’t assume the cheapest insurance isn’t enough – if you’ve ever looked at a comparison site, you’ll know that policies offer varying levels of cover at differing prices. However, the most expensive policy doesn’t always provide the most appropriate cover for YOUR pet. For example, would you want to cover your cat for theft or loss if they’re a 100% indoor cat? Don’t pay for more cover than you need – choose the cover that best matches the needs of you and your pet. Keep your pet healthy – ensuring that you take good care of your pet could save you money on your vet’s bills and reduce the chance of them becoming sick. So always make sure that you take your pet for the recommended vaccinations and annual boosters, feed them a healthy diet with not too many treats, protect against worms and fleas and look after their teeth and dental health. Spay or neuter your pet – spaying and neutering may lower your premiums as it reduces the chance of your pet developing certain conditions, such as cancer of the womb, plus it’s said to stop males from straying and causing a nuisance. Pet insurance is in its infancy in New Zealand, and when it comes to taking out pet insurance in NZ cost is still one of the major considerations. To find out how much it would cost to insure your pet, we offer no-obligation quotes online or over the phone. And to answer the question, is pet insurance worth it? Would you like to be in the position where you had to make a horrendous decision because you couldn’t afford the vet’s fees? No – we think not!